One of the important symbols in Mathematics is the Infinity. It resembles a lying ‘8’, where one cannot figure out the end or the beginning. Infinity means endlessness . Just like the vastness of the universe and the countless number of stars in the galaxies, infinity is a symbol of no limits. This symbol is now trending with the youth, who have added a creative touch by associating it with abundant love and affection for someone. 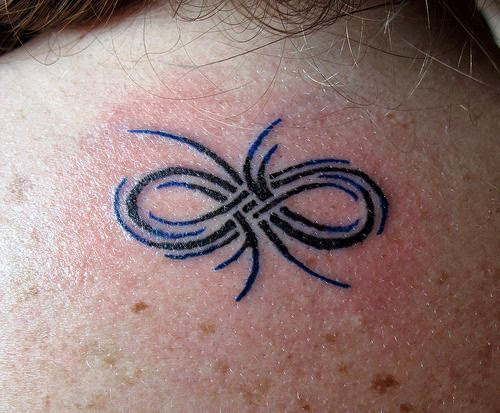 Getting infinity symbols inked on bodies is considered to be the best form of tattoo art , as it can be customised to declare a number of feeling like “love”, “friendship” and “relationship”. 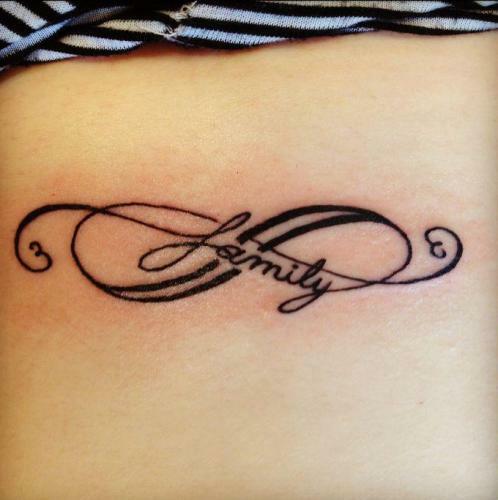 Check out more about infinity tattoo designs and their meanings. The infinity symbol has a rich and important meaning. It is considered as one of the top choices of tattoo artists when they want to make something creative. 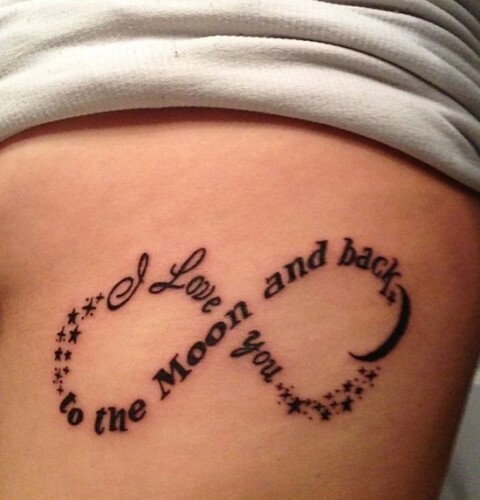 Often infinity tattoo designs come with quotes which are inspirational, sweet, etc. However, the significance of the infinity sign tattoo is that it conveys meanings that are closer to rebirth or reincarnation and holds a special place in Eastern culture. Religions like Hinduism and Buddhism also hold high and similar values for the infinity tattoo designs. Literally, the design means a ‘never ending loop’ and this could mean a never-ending cycle of birth and death. Forever and limitless are the associated meanings of this and is one of the best positive vibe spreading designs that you can try. If you’re interested in infinity tattoo designs then you should go through the list below which contains the best infinity tattoos with photos ideas ever. People like to get small infinity tattoo designs on their wrists. They look sweet and get the job done as well. Here, we have a beautiful infinity tattoo done on the wrists which is really small and cute and is done with black tattoo ink. This particular tattoo design will be suitable for both men and women. 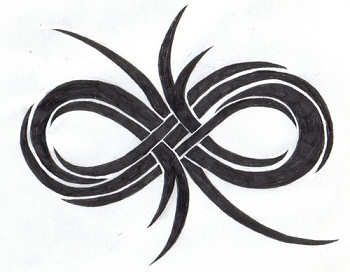 This double infinity tattoo design is absolutely mind-blowing. Here, the two infinity tattoos are done, one above the other. The design flaunts extraordinary beauty and can be sported by both men and women. The idea of this tattoo is so wonderful that anyone will easily fall in love with the design and want to get it. The tattoo will look great on the wrist. Girls can, however, get this tattoo on their foot if they want. 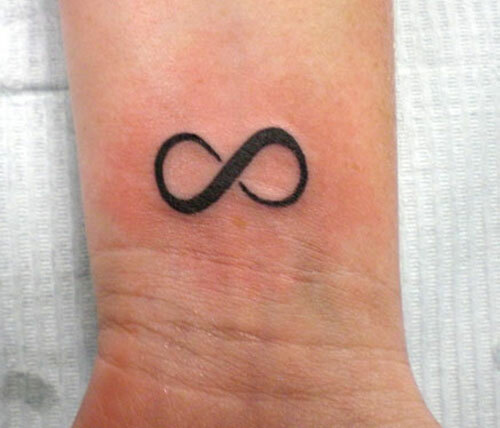 This is probably one of the most popular infinity tattoo design which is sported by tattoo-lovers throughout the world. 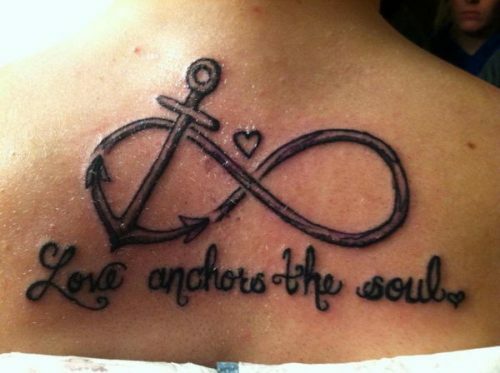 The tattoo sports a love vibe which makes it one of the most suitable tattoos for girls. They can sport this tattoo on their wrist or the forearms. 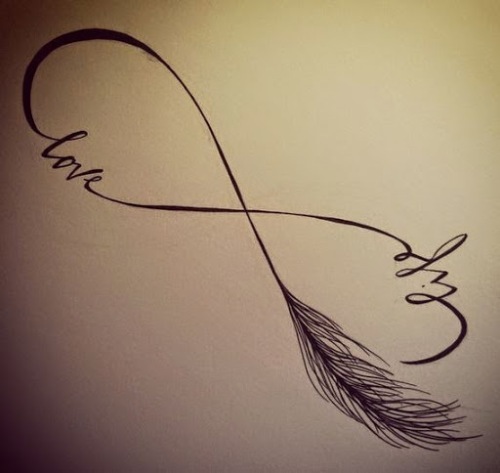 The tattoo is small and beautiful at the same time and is rightfully the best infinity tattoo to get on your arms. This infinity tattoo design will be suitable for brothers. The tattoo shows how beautiful a breather’s love can be for his sister. 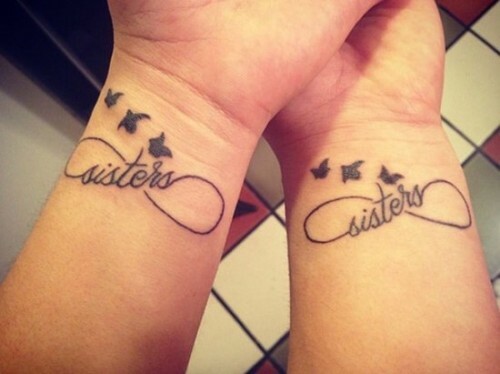 In the picture, the brother has tattooed his wrist showing his infinite love for his sisters. The tattoo also has the element of birds which make this design look extra alluring. 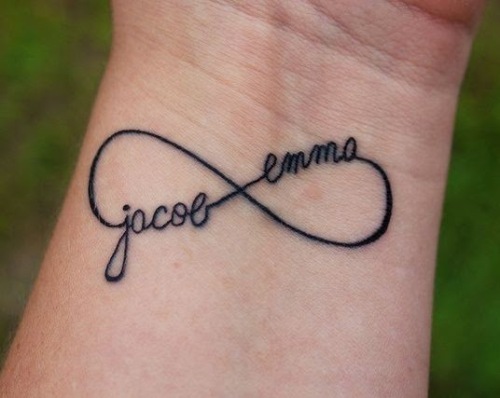 This is one of the best infinity tattoos for sisters. Hakuna Matata means no worries. This sweet and inspirational tattoo design will be suitable for both men and women. 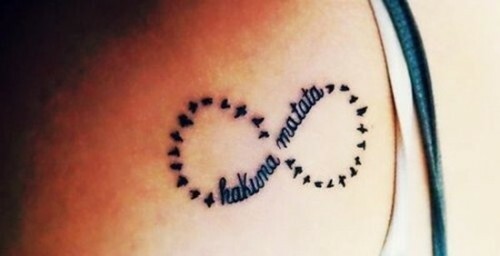 The Hakuna Matata tattooed in the form of infinity simply means that one will be free from all kind of worries about the rest of his/her life. Men can do this tattoo on the arms. However, women can sport it on their upper arms as done in the picture above. This colourful infinity tattoo has been done on the neck. The tattoo is truly beautiful and one can easily sport it on their feet as well. Black and blue color have been applied on this tattoo and it is one of the most beautiful tattoo designs ever. A criss-cross pattern has been followed while tattooing this design. One cannot simply appreciate his tattoo design enough. Apart from legs, girls also like sporting infinity tattoos on their back. Here, we can see a cute black infinity tattoo done on the back of the girl in the picture. The tattoo is so alluring that any girl would fall for it. People will admire you a little more than they did earlier just for this tattoo. Infinity tattoos with initials are really attractive. In this picture, the tattoo design with initials look very beautiful on the wrist. They are the minimal versions of name tattoos and when done on wrist, looks like a perfect accessory. 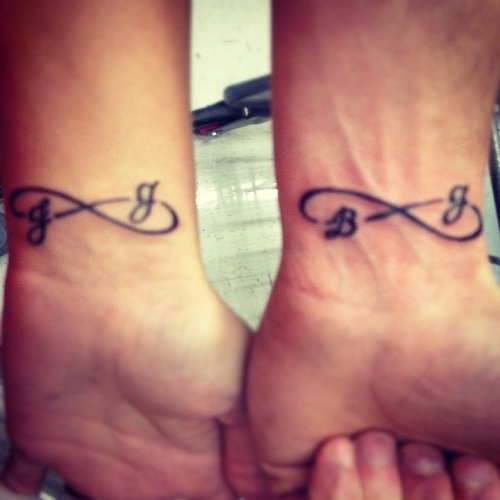 This is quite popular with couples who love to match their tattoos. Both men and women highly prefer the infinity tattoo designs with birds. The birds tattoo implies the freeness character and so peaceful also. The birds make the design so look so amazing. It is probably one of the best tattoo designs done on the wrists. Such tattoos can also be done on the neck, upper arms, etc. With the help of this tattoo design, one can show off the love for his/her family. 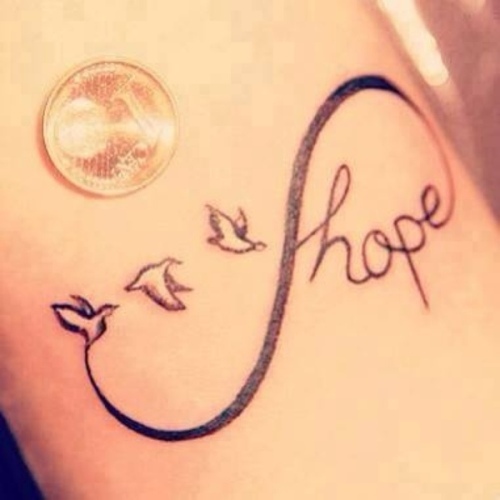 This is one of the best tattoo designs with beautiful meanings. The tattoo means that we can never love our family enough. Each and every family member has a special place in our heart and this tattoo just brings out that love in the form of tattoo art inked permanently on the body. These small infinity tattoos are basically done by beginners who just want to get the feeling of ink on their body. If they feel good about it, then they go for doing more ink jobs on their body parts. This design can be easily done and is actually tattoo design for teenage girls. Here, we have a beautiful combination of sweetness with ink. 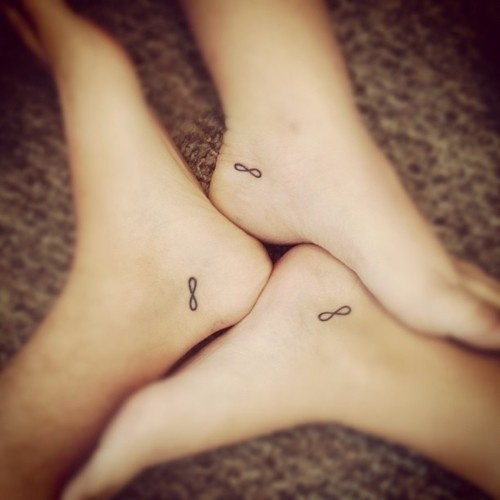 It is one of the best infinity tattoos for best friends. This is another popular form of tattooing with infinity designs. Here, two names are used on each side of the lying 8. 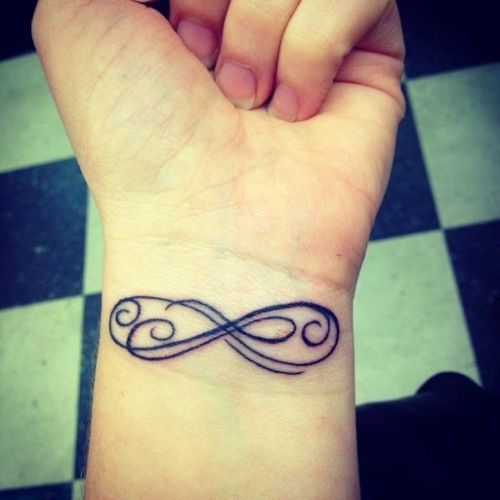 It is one of the most popular infinity tattoo designs for both men and women. Mostly this kind of tattoo flaunt by couple and lovers. This is a brilliant way of showing love for your mother. Get this tattoo and show your mom to make her day awesome. Getting this tattoo would definitely prove what an awesome child you are. It can also be personalised to suit lovers who are head over heels in love with each other. 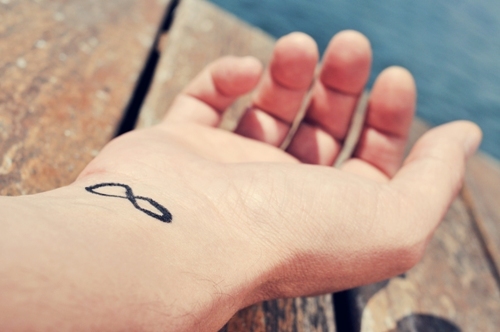 This beautiful infinity symbol tattoo is one of the sweetest tattoo designs ever. It will be appropriate for both men and women. One can easily painted this cool infinity tattoo any part of the body. 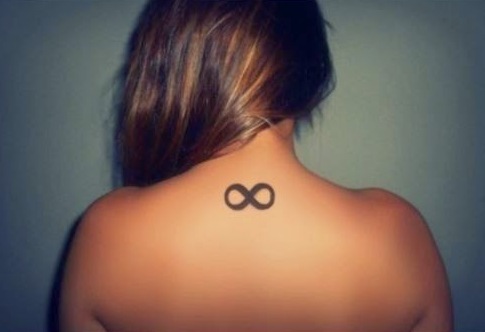 This is one of the popular small infinity tattoos for girls. This one is inspired to keep it ‘light’. 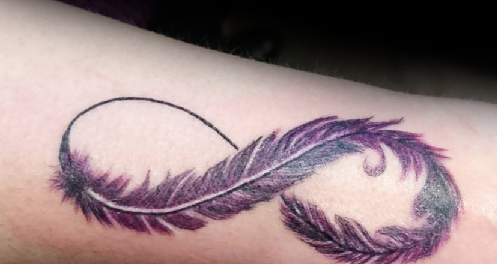 The feather symbolizes the lightness and tattoo is done on black ink with shaded areas in between. The contrast of shades in the centre and at the tapering ends, makes this a beautiful infinity tattoo that you definitely must try. 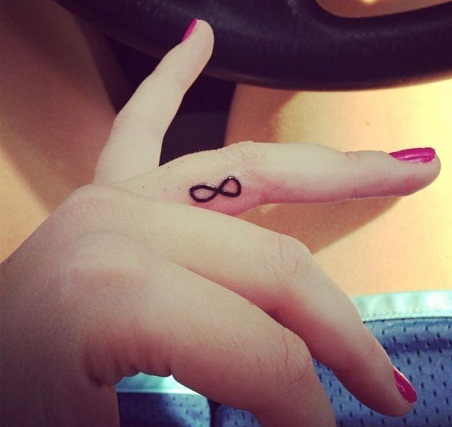 How about a cool infinity tattoo on your finger, that is just plain simple and beautiful? This tattoo is beautifully inked in between the finger, on the ring finger. It is jet black and is a good contrast to your skin color.This is also one of the subtle ways of revealing your personality, without having to say it aloud. How about something fancy on your hand? 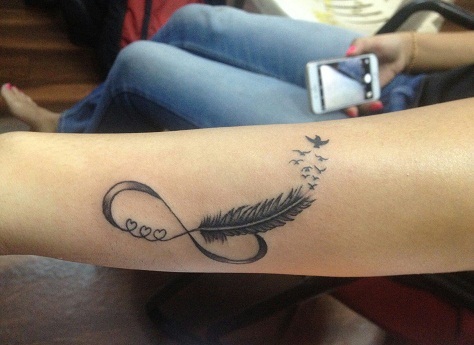 This infinity tattoo on your hand is beautiful and depicts how one wants to truly be light and fly away like a bird. The tattoo encapsulates the right feeling and is done beautifully in black ink. The entire tattoo alternates in dark and light shades, and this contrast is a beauty to admire. This one is done on the foot and is evidently visible. The tattoo puts the word ‘believe’ on loop and depicts how we all believe in one another in the world. The wordings can be changed if you like, to what you like and believe. It gives a beautiful and unique appearance to the infinity loop. 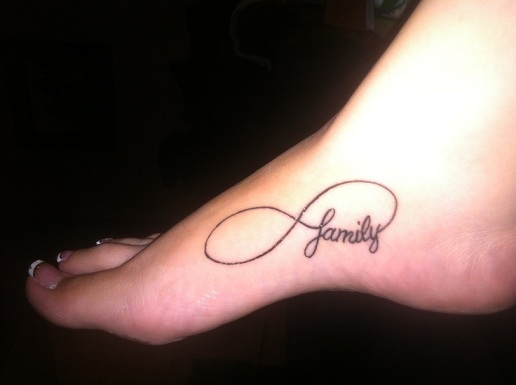 One of the classy tribal infinity tattoos is this one! This small infinity tattoo is inspired from tribal ideas and has dark shades of black. It has a lot of strokes than the usual one and is inspired to look dark and deep. You can try this design on your arms or forearms and is sure to leave an influence on others. Best Suitable For:Suitable for men and women, who are deeply associated with their roots and wish to discover the possibilities of life after death. Here is a beautiful infinity flower tattoo that has mix of several colors. The red and black contrast well, making it look attractive and the green color is an eye candy. 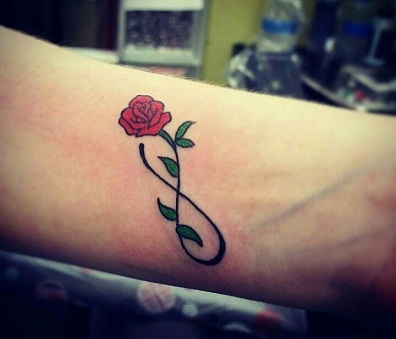 The rose on the end is done beautifully, making the tattoo look crisp and neat. Try this mix of colors for a change! Best Suitable For:The infinite rose tattoo is specially for women who believe in the cycle of life and death. 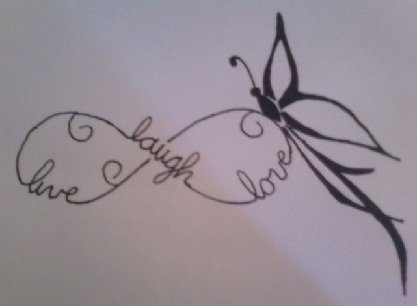 Another cute tattoo idea is to have a butterfly one. The tattoo has the butterfly design, along with small wordings written. It is inspired to look light and can be best done on the wrist or hands. It represents optimism and hope in life by wishing for infinite feelings of love, laughter and happiness. 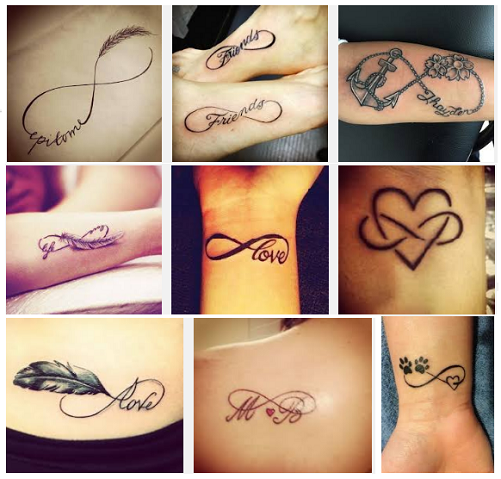 Infinity tattoos indicate eternal, long lasting relationships. If you are planning to get names inserted in them, it could mean a big commitment. Depending on the message you wish to declare, you can customise them with names, quotes and even symbols. Try to get a decent sized image of infinity symbol, as very tiny images may end up looking distorted. Infinity tattoo designs are certainly not going out of fashion any soon. They are ever-green, subtle and chic looking tattoos which can also be quite meaningful. Depending on how you want the tattoo to look like, Infinity symbols can be combined with many elements to give the desired output. Infact, the creativity associated with these tattoo designs is as endless as the symbol itself. If you love someone dearly or believe strongly in something, there can be no better way to say it, than with an infinity tattoo etched on the body. After all, life is too short to limit oneself! ← Previous Story 17 Best Sanskrit Tattoo Designs To Honour the Language! 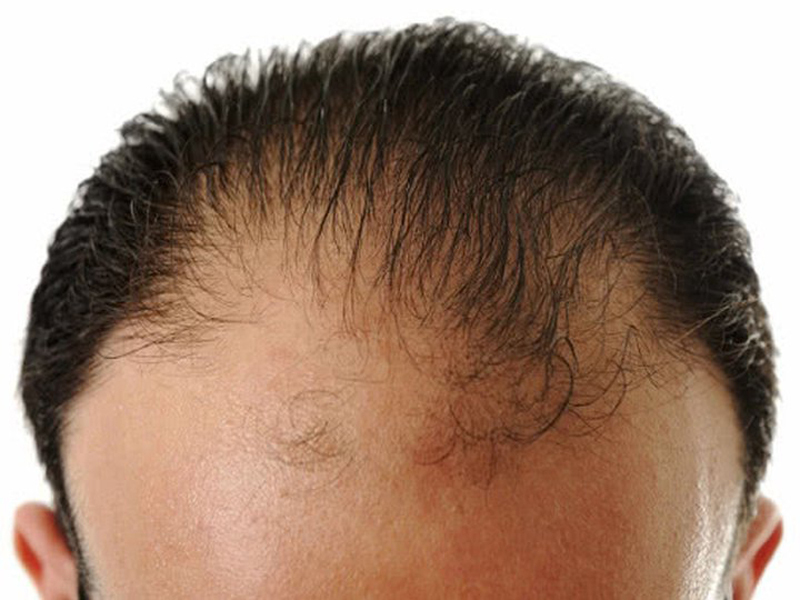 Frontal Hair Loss – How to Treat and Prevent?